Integrated with technological features, energy efficient hand dryer, great looking, compact and price competitive package. Automatic activation makes this a very low maintenance hand dryer. Hand dryers reduce the costs involved in drying hands, they reduce the expenses by an average of 90 to 95% compared to paper towels, also reduces germs and keeps restrooms litter free. Our aluminium hand dryers are made from durable die cast aluminium with epoxy finish. So it is hassle free to maintain as they are free from rust and to clean them, just wipe off with a damp cloth. Our hand dryers are the most quietest and affordable one and provide an eco-friendly solution when compared to paper towels. 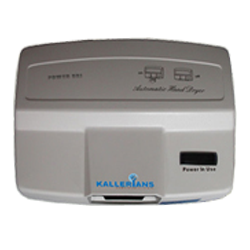 Aluminium hand dryers from Kallerians is completely automatic and easy to install and use. 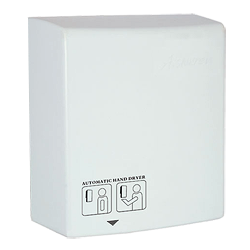 Our hand dryers are surface mountable and operates with quiet sound level. Kallerians hand dryers plugs into a standard outlet and no need of special wiring. They are the ideal solution for residential and commercial use. Hand dryers is the most effective choice that outweigh the expenses caused by using of paper towels.